Anyone Want to Lend Me a Few Hundred Dollars? It would go toward something awesome. I've ogled these forever and they are finally available to purchase as reproductions. 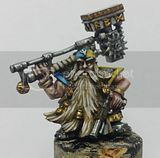 I love the understated, almost trapped energy of the early shade-and-wash pieces and I desperately want at least one so I can study the technique in detail...can't currently justify the cost though. Desperation is one of the more discernible flavors in the sour mélange of material I’ve come up with for the Wyrdwold over the last year or two. I think that’s because, from a narrative standpoint, desperation is often the only motivation that makes sense out of the actions we choreograph for our little men. Because what we fetishize with wargaming is pretty dark. Violence, murder. Desperation. We don’t always notice it because it is buried beneath layers of strategy, or fantasy, or artistic expression, or abstraction, all of which make this such a rewarding hobby…but we serve no one if we ignore the kernel from which it springs. Which is why, I guess, when I found myself at Games Plus in front of the Wall o’ Reaper with some money burning a hole in my pocket, I was drawn to these sculpts. Even in the bare metal, they communicated to me such a sense of raw fear. I don’t know if I managed to bring it all through in the painting. Don’t really care to be honest. I found them uncomfortable to paint— though not because there was anything wrong with the sculpts. Rather, I found myself contemplating what could be in front of them to inspire such fear, such desperate violence. Sorry for the stillness around here over the last week. Been quite ill to the stomach in a way that I had naively assumed I might never have to deal with again ('oooh, look at that 26 y/o male, thinking he's invincible, yeah, yeah). I did, however, like the pitted, corroded metal effect the dry-brushing gave to the helmet and the sword . Quite suitable to the creaking, somehow stolid menace that, for me, this sculpt exudes, and which drew me to buy it in the first place. I'd be interested to know your thoughts. Animate them, encase them in rusting, clanking armor, and bid them stand fast on the unknowable horizon of the comments box below.